The purpose of the systems and models I deﬁned during my research, is to map the aspects and elements that together determine the shapes and consistency of the graphemes in use for representing the Latin script, i.e. the letters and characters, and the way they interact. So, the subdivision of scripts into the systems and models, as shown in the diagram below, is speciﬁcally meant to illustrate the Latin script, although (parts of) the subdivision might be applicable for other scripts too. However, this is beyond the scope of my research. Please note that the classiﬁcation used here seems to clash in some cases with the traditional, actually rather coarse, nomenclature used in the practices of the calligrapher, type designer, and typographer. 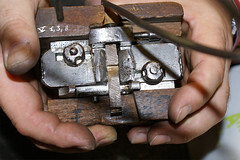 For instance the term ‘roman type’ comprises both the capitals and the lower case letters. 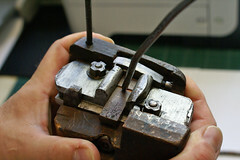 The term ‘textura type’ comprises both the majuscules and minuscules. But this clash of classiﬁcations simply marks the difference between science and the general workﬂoor; for a detailed description of the underlying patterns and structures of letters, and subsequently typography, a more reﬁned indexing is required. Scripts form the apex of a system that comprises writing systems, graphemes, grapheme systems, harmonic systems (which can be subdivided in harmonic models), relational systems, proportional systems (which can be subdivided in proportional models), and rhythmic systems. Scripts can be related, like for instance the Cyrillic script shares elements of the Latin and Greek scripts. Writing system is the orthographic term for a collection of graphemes, and the subsequent rules required to represent one or more (by deﬁnition related) languages. Translated into typographic terms, a writing system contains glyphs, which are formalized and ﬁxed (ﬁxed as synonym for incised or engraved) language(s)-speciﬁc graphemes. Graphemes are the units that make up a writing system. They are basically in general the graphical equivalents of phonemes, i.e. the basic units of spoken language. Graphemes comprise letters, syllables, characters, numerals, and punctuation marks (of which there are no equivalents in speech). One can consider this collection as a container with all variants of all informal and formal grapheme-variants, i.e. 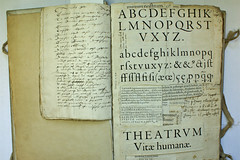 grapheme systems, used or in use for a writing system, such as for instance capital, uncial, textura, rotunda, Humanistic minuskel, roman type, italic type, fraktur, et cetera. Graphemes in their written form are by deﬁnition modular, because they are the results of the recurrent appliance of relatively restricted movements made with a certain writing tool. In their typographic form graphemes show the same modularity as a result of the transformation of the handwritten forms to formal variants. The extent to which graphemes form coherent groups depends on how consistent these movements are. For instance some graphemes can be made (unintentionally) smaller or wider than other ones, which will result to some extent in an obstruction the rhythm. Grapheme systems are collections of graphemes which share general constructional aspects. The combined graphemes don’t necessarily have to share the same morphological background; they can be ‘glued’ together by design, i.e. the tweaking of details (see: harmonic models below). The combination of graphemes with different morphologic origins in a grapheme system can for instance be the result of an evolutionary process, but also of the direct interference by scholars, like Alcuin of York’s inﬂuence on the shaping of the Carolingian minuscule. In the Greek and Latin scripts the core of every grapheme system is formed by the alphabet. The grapheme systems, either calligraphic or typographic, in use for representing the Latin script since the invention of movable type are capital, uncial, book-hand minuscule, and cursive minuscule. Each grapheme system comprises variants, i.e. harmonic systems, which are often the result of evolutionary processes. 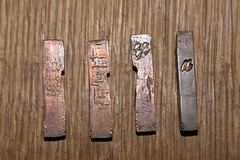 These variants share the same overall morphology, but their details are different, like for instance inscribed, written, and typographical variants mutually differ. It has to be noted here that the role of the grapheme system uncial has been relatively small, and its present-day use is restricted to Gaelic, the Celtic language of which exist Irish and Scottish variants. Harmonic systems are formed by speciﬁc variants of grapheme systems. Being subdivisions of grapheme systems, harmonic systems by deﬁnition share the same basic structure, but differ in proportions and/or details. For instance the grapheme system Latin capital comprises the harmonic systems Roman imperial capitals and roman type capitals. These two harmonic systems differ in proportions and details, like the form of the serifs, but they share the same basic structure. Also the written Renaissance capitals incorporated in the Humanistic minuscule form a separate harmonic system within the grapheme system capital, because they differ in details from for instance the lapidary and typographic capitals. Still, the written capitals share the same morphology as the regularized and formalized variants. Greek capitals are part of a different grapheme system, due to their different forms. The same subdivision as for the grapheme system capitals can be made for the grapheme system book-hand minuscules. The minuscules of texture (type), rotunda (type), Humanistic minuscule, and the lower case part of roman type are harmonic systems within this grapheme system. The minuscules of bastarda, schwabacher, fractur, Humanistic cursive, and cursive type form different harmonic systems, which are all part of the grapheme system cursive minuscule. Harmonic models are subdivisions of harmonic systems based on the morphological origin of the graphemes combined. The consistency of a harmonic system depends on the number of harmonic models it comprises. For instance the lower case of roman type contains two harmonic models. There is a primary, i.e. dominant, one for all letters with exception of the k, s, and the v–z range. The letters which are part of the primary harmonic model are all constructed with the same basic elements. The exceptions form the secondary harmonic model; these letters have a different morphological background, because they ﬁnd their origin in the grapheme system capitals. Relational systems comprise the (relative) boldness or weight, and amount of contrast in the graphemes. In terms of the broad nib it describes the relation between the nib-width and the x-height, and the relation between the nib-width and nib-thickness. Proportional systems describe the relationship between the x-height and the width of the graphemes. It also describes the relationship between the size of the x-height and the lengths of the ascenders and descenders. These aspects are captured in the proportional models (see below). Proportional systems also can comprise cross-grapheme system information, such as the relation between the proportions of the minuscules of a book-hand and the accompanying capitals (or majuscules, if applicable). These aspects are captured in dynamic em-squares (see also: 3.3.1 Notes on patterns and grids). Proportional models deﬁne the degree of compression or expansion in the primary harmonic models. There can be more than one proportional model in a harmonic model, which theoretically indicates that there is an inconsistency in the construction (read: design). In that case there is a usually a primary, i.e. dominant, proportional model and a secondary one. Rhythmic systems deﬁne the intervals of stems and the relation between the counters and the space between the graphemes, i.e. the spacing (ﬁtting). This implies for instance that a change in the proportional system will lead to an increase or decrease of the spacing because it will change the rhythmic system. Irrespective the number of proportional systems there can only be one rhythmic system in a harmonic system, otherwise the spacing will result in separated, i.e. 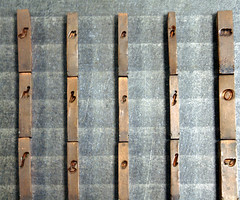 isolated, groups of graphemes. All systems directly interact, and inﬂuence each other. The appliance of multiple proportional systems will for instance result in differently sized counters, and subsequently will by deﬁnition obstruct the rhythmic system. This entry was posted in 1. Introduction, 1.1 Purpose and goals. Bookmark the permalink.